Grilled pork chops are even better after being marinated in a flavorful honey mustard sauce. This recipe is easy and oh so good! Light your grills and get your appetite ready! Honey mustard grilled pork chops are about to grace your plates. Chops are even better when marinated in tons of flavor! My husband always gets excited when I ask him to grill. No matter how hot (or cold) it is, he is happy to stand over the grill. During the heat of summer it is a great way to get dinner on the table without heating the whole house. Plus Little Dude loves it because he is likely to get some extra time playing outside. I like to make a couple of simple summer salads to go along with whatever he's making. I made a sour cream and dill cucumber salad and Russian style beet salad to go with these. 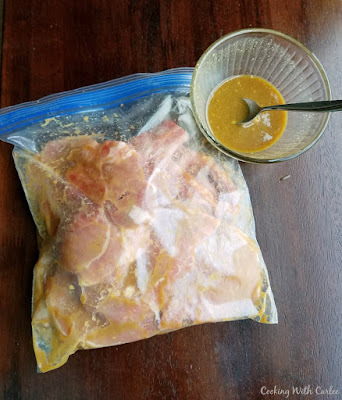 The pork chops are better given a chance to really soak in some flavor, so they went in their sauce at about lunch time. I went ahead and made the salads then as well. They both taste better after a chance to let the flavors meld as well. So I got to spend the afternoon enjoying our revolving door of company without worrying about how dinner would get done. When the grill was ready I only had to dig out the marinated chops and the extra marinade for brushing and kick my feet up while my husband and the trusty grill took it from there. Sometimes you can barely taste the marinade on meat. That is not the case here! They were full if flavor. Of course being brushed with the reserved sauce on the last flip didn't hurt anything! Tender flavorful pork chops are always welcome at our table. What are your favorite things to grill? Mix together all of the ingredients but the pork chops. Pour about half to 2/3 of the sauce into a zipper bag and add the pork chops. Seal the bag and move the chops around to make sure they are all coated. Refrigerate for at least a half hour but up to a day in advance. Light your grill and warm to medium heat. Cook for a few minutes on each side, until almost cooked through. Brush the tops with the remaining sauce and cook for a minute or two to set, then flip and brush the other side. Use your thermometer to ensure the meat is done and enjoy! 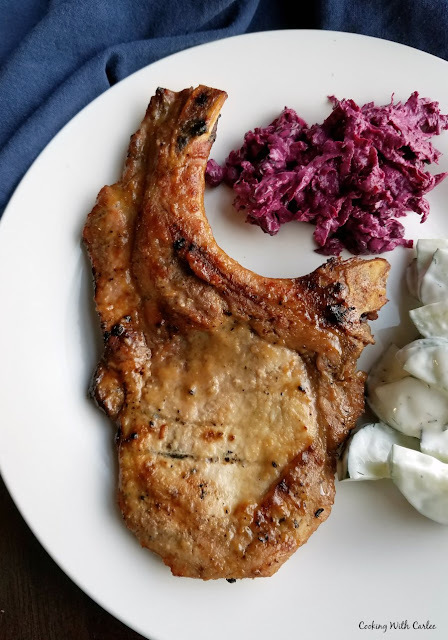 We do love pork chops and this honey mustard grilled variation sounds sooo good. And it is always nice to turn the cooking over to the hubby! It is nice to let the husbands step in every once in a while, isn't it? This makes prep easy and you don't have to carry a ton of spices out to the grill! 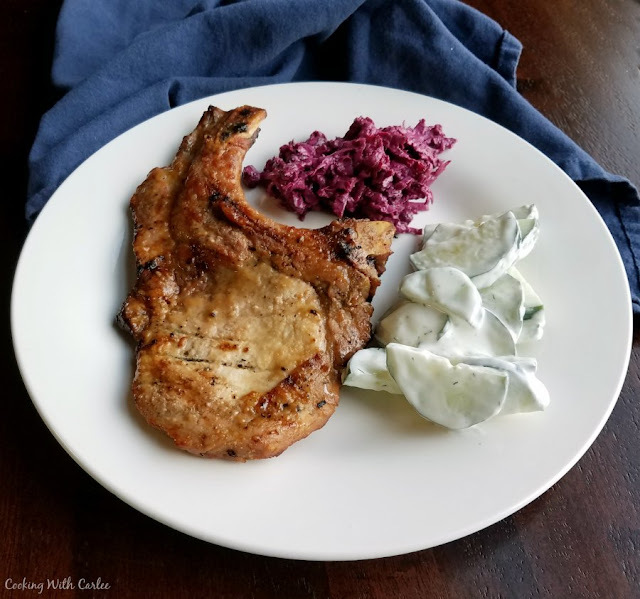 We love grilled pork chops! We actually had them for dinner tonight. I'm going to have to try this recipe. I bet they are so delicious marinated in the honey mustard. Thanks for sharing at the Whimsical Wednesdays Link Party! They are one of our favorites too! Thanks! This looks like something I'd make over and over again! A keeper! It is so quick and tasty.